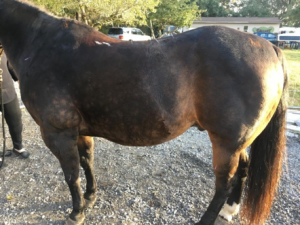 Poco is a 22 year Quarter horse with a history of Equine Cushing’s Disease who presented in December of 2016 for a swollen pruritic sheath. Physical exam was unremarkable, sheath was mildly edematous. Owner elected to try medial management with antihistamines both hydroxizine and trihis granules. Poco represented in January of 2017 for abdominal wound from trying to scratch his sheath on a T-post in the pasture. The T-post had penetrated through the skin but not into the abdominal wall. The wound was treated medically with banamine and uniprim. At this time his owner elected steroid injections as needed to control the itch. Poco has been getting dexamethasone injections every 4-6 weeks this summer to help control the pruritus. Therefore we elected to try acupuncture to try and decrease the amount of steroid injections Poco needs. Physical Exam and Clinical Assessment: Poco’s physical exam was unremarkable. He has been managing well on 20mg of dexamethasone injections as needed, about every six weeks in the summer months. Myofascial exam revealed a sore back with taught bands from BL 18-25. Therefore, I elected to treat for back pain as well as pruritus by targeting immune modulating points as well as points for the skin and pruritus. 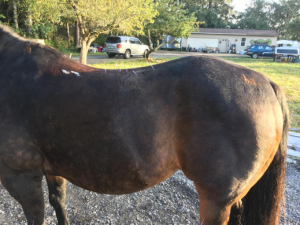 Medical decision making: Due to Poco’s history of Equine Cushing’s steroid injections are contraindicated therefore we elected to try acupuncture to help control pruritus and sheath edema. Medically we have exhausted all medications to try with antihistamines and steroids. We elected to start acupuncture treatments around the time the next dexamethasone injection would be needed and try three treatments twice a week to start. Acupuncture Points used: BL 18, BL 21, BL 23, BL 25, BL 36, BL 40, GV 14, LI 16, LI 11, LU 7, HT 7, ST 36, SP 10, and Bai Hui. Poco was reactive to the bladder line 18-25 on both sides but would relax about 6 minutes into a treatment and start to drop his head. I used LI 11 to target immune modulation as well as inflammation and hives. Even though Poco is not showing hives we suspect some type of allergic reaction. LU 7 was used to target skin disorders. LI 16 and HT 7 were used to target anxiety in case this was more of a behavioral problem for Poco. ST 36 was used as an immune modulating and anti-inflammatory point. SP 10 was used for its help with erythematous and pruritic skin conditions. Differential diagnosis remains open but we suspect an allergic origin. Poco was very receptive to his acupuncture treatments and has not needed his dexamethasone injection and we are one week out from when it was due. We are unsure how often Poco will need to be treated to control his pruritis but will attempt to wean down to once weekly in the next few weeks. Through the first three treatments Poco’s back has remained taught and reactive to dry needling. 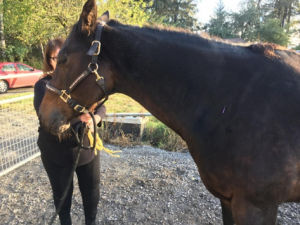 The owner has not ridden him since the start of treatment to evaluate if the treatments are helping with his back pain. Dentinger, Taryn. “Acupuncture for Equine Allergies.” Acupuncture for Equine Allergies, 1 Mar. 2013, doi:http://ivcjournal.com/acupuncture-for-equine-allergies/. 2015 OneHealth SIM, Inc. and Narda G. Robinson. “Medical Acupuncture for Veterinarians Equine Point Mini-manual.” One Health Sim. 2015.